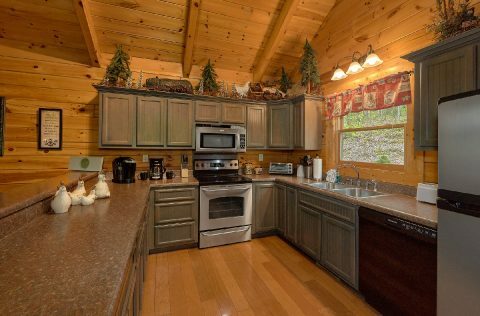 Come enjoy this theater cabin near Gatlinburg! 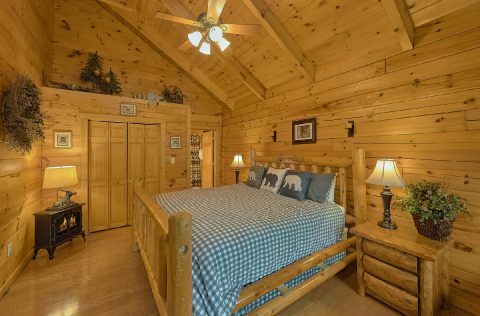 "A Bear Affair" is a log cabin between Gatlinburg and Pigeon Forge in the Tennessee Smoky Mountains offers an authentic theater room complete with a 10-foot theater screen, theater seating for up to 8 guests, a Blu-ray/DVD Player, surround sound, and a large selection of movies for your enjoyment! 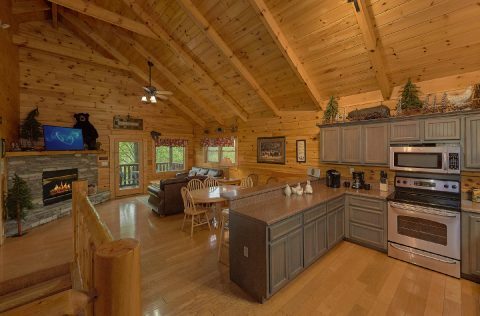 "A Bear Affair" cabin rental is located in Sky Harbor Resort, between Gatlinburg and Pigeon Forge. 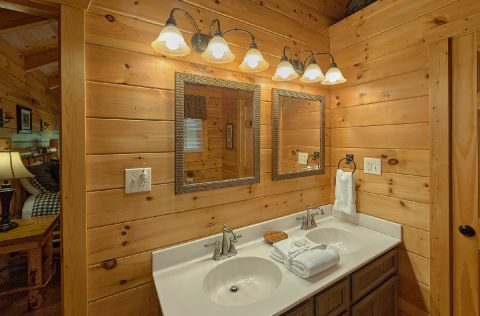 With easy access to both nearby cities, it's easy to plan a vacation that allows you to visit all the top things to do. 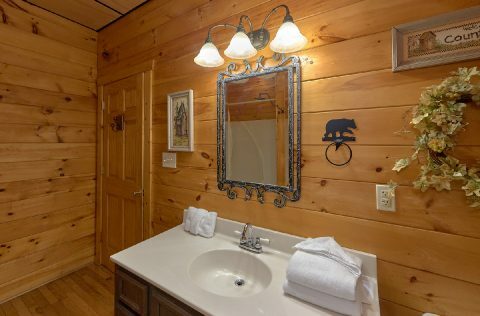 Nestled in the heart of the Southeast's largest playground of attractions, theaters, family activities, and outlet shopping, families, and groups are bound to find plenty of adventure and excitement at the cabin and about town. 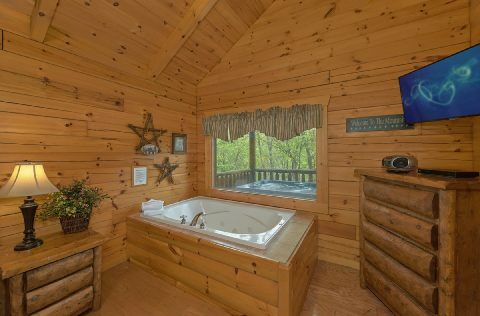 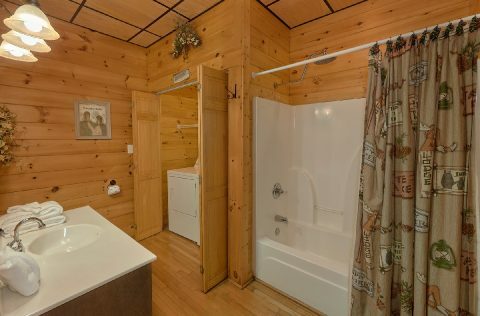 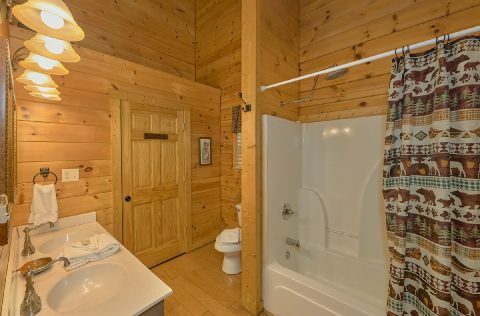 Your Gatlinburg theater cabin has two master suites, each with its own romantic jacuzzi tub. 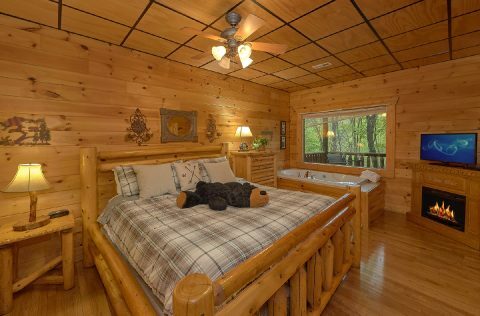 One of the two master bedrooms has a cozy electric fireplace for those windy winter nights. 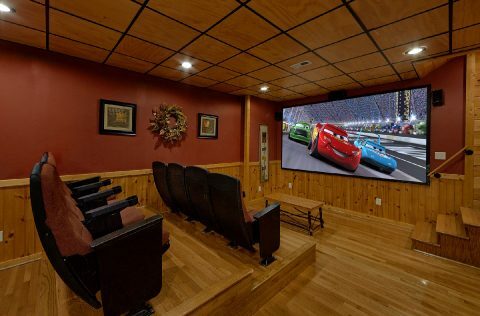 For hours of in-cabin entertainment, a full game room is provided for guests. Enjoy some friendly competition with a pool table, foosball table, PlayStation 2 Game System and a collection of PS2 games. 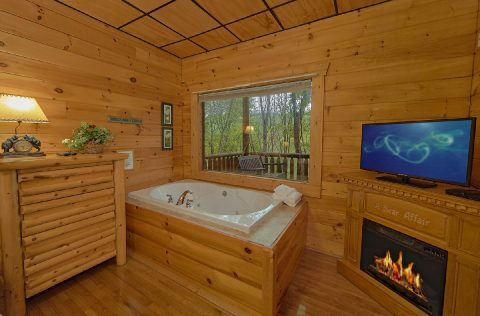 The cabin's relaxing year-round hot tub is even available in the winter! 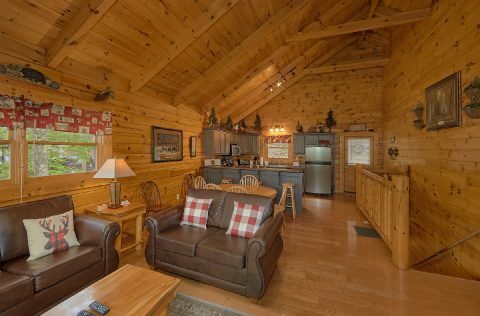 Free wireless Internet allows you to share all the vacation fun on Facebook, Twitter or Instagram. 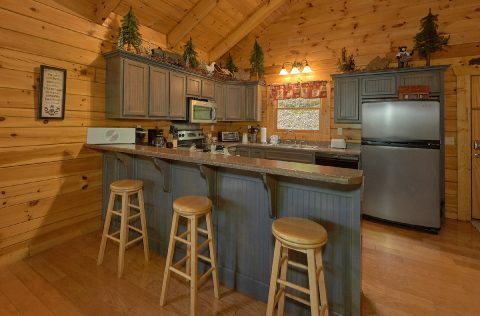 Your cabin rental with a theater room features other luxury amenities: a fully equipped kitchen for the perfect country breakfast, a charcoal grill for cookouts in the great outdoors, a cozy stone fireplace, cable televisions, and five DVD players. 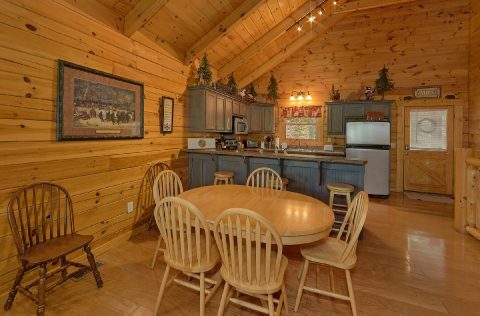 With 2 king-size beds and a sleeper sofa, this comfortable Smoky Mountain cabin can sleep up to 6 vacationers. 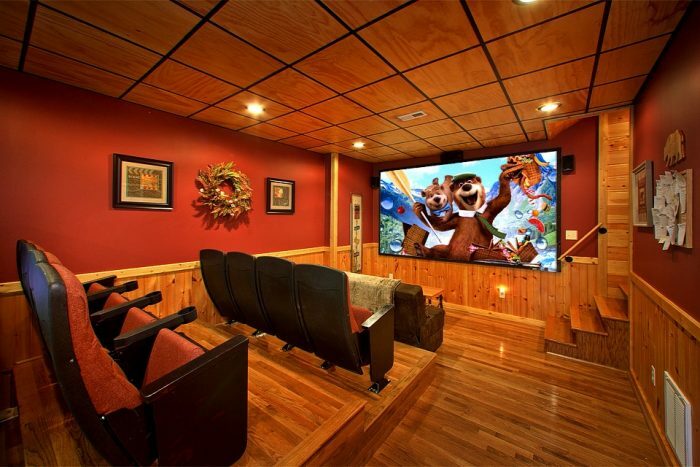 Book your theater room cabin near Gatlinburg online with Cabins USA Gatlinburg for our online cabin special that will help you save on one of the most memorable family vacations ever!